In previous posts in the 50 Marriage Mondays series, I examined Marriage certificates, which are certified copies of entries in marriage registers introduced by civil registration in 1837. This marriage occurred just 3 years earlier, so I turn instead to the parish marriage register. 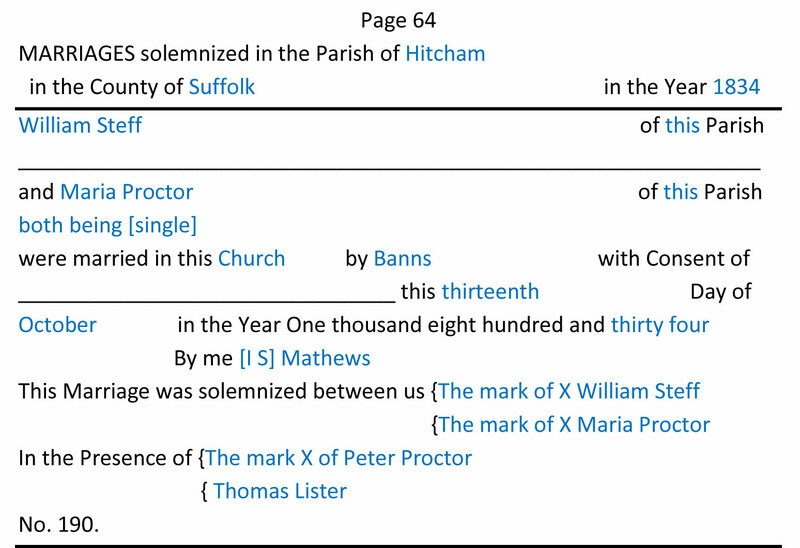 Due Suffolk Record Office’s terms of access, I cannot share an image of the printout from microfiche, so present a transcript. The Parish Register Act 1812, also known as Rose’s Act, introduced this type of pre-printed register with numbered pages and entries. It contains similar information to that collected after 1837, but lacks explicit ages and occupations of the bride and groom; and names and occupations of the couple’s fathers. Consent was required from a parent or guardian if either the groom or bride was under 21, so we can deduce that both William and Maria were over 21. However, the 1851 census records William’s age as 46 and Maria’s as 34, so we can calculate they were 29 (born ca 1805) and 17 (born ca 1817) respectively in 1834. Note that neither could write, hence “the mark of”, so William could not have corrected the spelling of his surname. Steff is often spelled as Stiff, especially in later Hitcham records. Back in 2002, I found details of this marriage and other information on Raymond Erle Long’s “The Cosford Database” website. William STEFF was born on 7 Dec 1803. He was baptised after 7 Dec 1803 in Wattisham Baptist Chapel, Wattisham, Suffolk, England. He was baptised on 12 Sep 1813 in Hitcham, Suffolk, England. He died in 1872 in Hitcham,Suffolk, England. He was buried on 26 Jun 1872 in Hitcham, Suffolk, England. He is entered on the burial record as aged 68. William aged 46 and his wife Maria aged 34 were living with their children in Hitcham at the time of the 1851 Census. Parents: William STEFF and Hannah GRIMWOOD. He was married to Maria PROCTOR on 13 Oct 1834 in Hitcham, Suffolk, England. Children were: William STIFF, Harriot STEFF, Eliza STEFF, Isaac STIFF, Walter STIFF, Hester STEFF, Arthur STEFF. However, the website no longer exists. On further investigation, I found that the author died in 2008. Although there is some discussion about re-instating it on various forums, I only found dead links. William STEFF was born on 7 Dec 1803 in Hitcham, Suffolk, England. He was baptised on 12 Sep 1813 in Hitcham, Suffolk, England. He was a Labourer between 1835 and 1856 in Hitcham, Suffolk, England. He died in 1872 in Hitcham, Suffolk, England. He was buried on 25 Jun 1872 in Hitcham, Suffolk, England. His age is entered on the burial record as 68. Parents: William STEFF and Hannah GRIMWOOD. He was married to Pheobe Maria PROCTOR on 13 Oct 1834 in Hitcham, Suffolk, England. Children were: William STIFF , Harriot STEFF, Eliza STEFF, Isaac STIFF, Walter STEFF, Hester \ Esther STEFF, Arthur STEFF. In particular Maria is now named as Pheobe Maria. The baptism register confirms this name. She appears on the 1851 census as Maria, but as Phoeby on the 1861 census. Like William, she could not correct the marriage or census records. The website names her parents as Thomas Proctor and Bridget Buckle and one of her brothers as Peter, a witness to the marriage. It is a pity that the website does not include source information, as that would help me resolve the discrepancies in this couple’s records.